In response to today’s TNS poll, RISE is highlighting the fact that, for supporters of Scottish independence, their second ‘list’ vote will be wasted on the SNP due to the nature of Scotland’s electoral system, and that there is a “unique opportunity” to create a “diverse, pro-Yes parliament” at Holyrood while still having a majority SNP government. The TNS poll shows that the SNP are on course to win nearly all of the constituency seats in the Scottish elections next year, more than enough to secure another majority government in the next Scottish Parliament. As well as this, the SNP are set to gain the highest amount of votes on the second ‘list’ vote across all eight regions, but while winning far fewer seats than Labour and the Tories on the list due to the way the D’Hondt counting system works. Despite the SNP getting over half of the list vote, the party is set to win only 6 MSPs on the list, with the vast majority of list vote MSPs going to Labour and the Tories. If the SNP’s second vote was split more evenly between other pro-independence challengers it would mean that there would be a higher overall number of pro-independence MSPs in the Scottish Parliament, and far fewer Labour, Tory and Lib-Dem MSPs. A RISE spokesperson said the TNS poll was evidence of a “unique opportunity” for the pro-independence movement to create a “diverse, pro-Yes parliament”, if the message about how the Scottish voting system works could be gotten out to the population at large. “The polling has been consistent for months: the SNP will win another majority government on the constituency vote alone; voting for the SNP on the second vote is a wasted vote for indy supporters and will mean less RISE and Green MSPs and more Labour and Tory MSPs. “One of the strengths of the independence movement was its diversity, now we have a unique opportunity for that diversity to be reflected in the Scottish Parliament." “A diverse, pro-Yes parliament means SNP voices, but also Green voices and socialist voices. RISE is the socialist challenge at next year’s Scottish Parliament elections: we’re standing to redistribute wealth in Scotland from rich to poor, for democratic public ownership of the economy, independence for Scotland on the basis of abolishing the monarchy and a Scottish currency, and participatory democracy in all parts of our lives." "I'll be backing Rise on the list vote in the Holyrood elections 2016, not because I'm a particular believer in tactical voting but because I want to see a strong, socialist pro-indy voice in our parliament. The Unionist parties are a busted flush, driven only by their hatred of the SNP, pushing their fiscal trap for the Scottish parliament under the guise of the new devolution settlement. We need a broad coalition of Yes forces in parliament in order to take them on and point the way forwards towards an independent socialist republic. 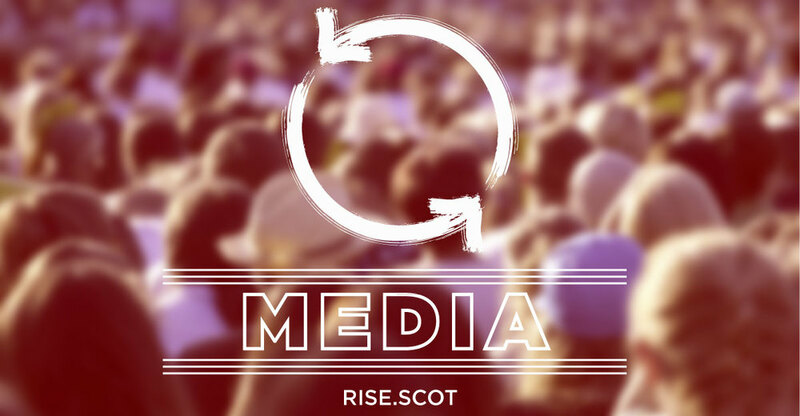 Rise have put class firmly on the agenda, and I think it's important that they are represented in Holyrood."